Turn any top you have-cropped, regular length or long-ish-into something extra-special. Ultra-lightweight body won't overheat when worn under another top, while the airy lace trim extends your look over leggings, slim-cut jeans or pencil skirts. Machine wash. 95% viscose/5% spandex. Imported. S(6-8), M(10-12), L(14-16), XL(18), 1X(18W-20W), 2X(22W-24W), 3X(26W); 30"L. Specify Chambray, White, Natural, Black, Aqua or Tangerine. 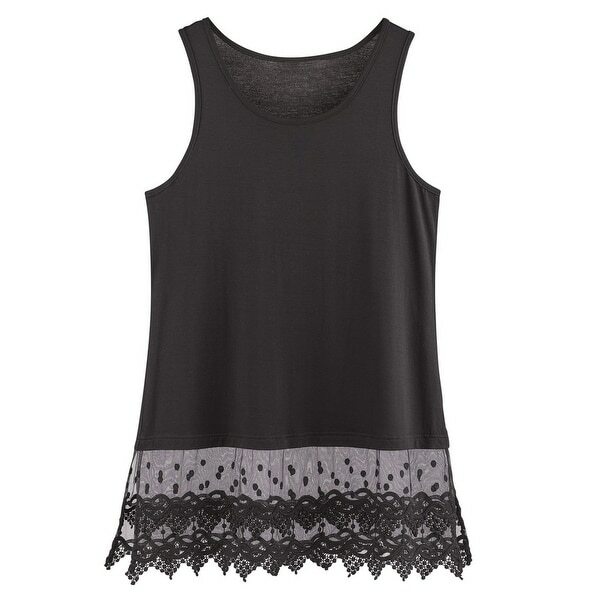 • ADD FLAIR TO YOUR FAVORITE TOPS: A lacy trim accent makes any outfit magic - dress up everything from T-shirts to blouses with this tunic extender. • KEEPS YOU COOL AND COMFORTABLE: Ultra lightweight body won't let you overheat while layering, even in warm weather. • LUXURIOUS FABRIC: Made of a soft and silky viscose-spandex blend that caresses your skin while staying breathable. • LOOKS GREAT WITH SKINNY JEANS AND LEGGINGS: Let the lace trim flutter over a trendy pair of slim fit pants or leggings to accentuate the features you love. Hangs 30" long. • A MUST-HAVE FOR YOUR WARDROBE: Essentially doubles the amount of looks you can get from your tops. This top will be a favorite to dress up or down. The material is soft and comfortable. The only issue I had was that the company the this shirt came from sent the wrong color and it was a bit of a hassle to return...they asked me to send a picture of the top that they originally sent. I had to contact Overstock's customer service twice to be able to resolve this issue. Overstock customer service was great but the manufacture not so much. As much as I love this top, I am not sure I would order another item made/disturbed by this company. Cute, fun top! Adds versatility to your wardrobe! I love this top! I am returning it because it is a Medium and is too big for me - but I re-ordered it because I was so pleased with the item. Keep in mind - these tops run true to size or even a little large. You should be OK ordering your normal size. The lace at the bottom is fantastic. Highly recommended. Fits perfectly and looks so cute under tops that are a little short. Love Love this shirt it fits great so now I have 3 of them!! I just love this tank. Have received many compliments. Can be dressed up or down. quality of material is excellent, very stylish. Surely recommend it. Nice, soft fabrication. Nice length as well. Perfect for under wrap around sweaters this season. They sent the wrong color. So bummed. Not worth the hassle to return. Ordered black.